Gourmet Girl Cooks: Cheese Head Pizza - Best Low Carb Crust Ever! This evening I made my Cheese Head Pizza Crust and made a huge pizza for both hubby and I and a separate pizza for my brother. We all have plenty of leftover pizza for our lunches tomorrow. 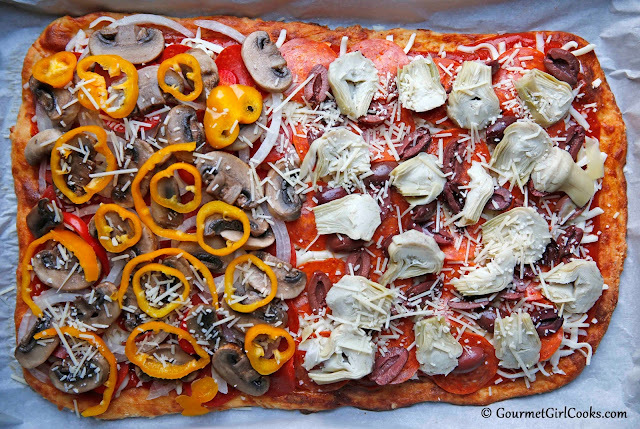 I had pepperoni, onions, mushrooms and red and green mini bell peppers on my half and hubby had pepperoni, Kalamata olives and artichoke hearts on his half. My brother had pepperoni, bell peppers and onions on his. The pizza turned out great. If you haven't tried this pizza crust yet...it should definitely be added to your "must try soon" list! I think you'll be surprised that it's really low carb and at how good it is. Also, I found a better and less messy way to spread the crust out than by using my hands. I simply plop the ball of dough on the center of my parchment lined cookie sheet and then pour the tablespoon of olive oil over top of the dough (instead of greasing my hands with it) and then use a rubber spatula to press and spread the dough out. It doesn't stick to the spatula and you have better control of shaping and spreading out the crust. 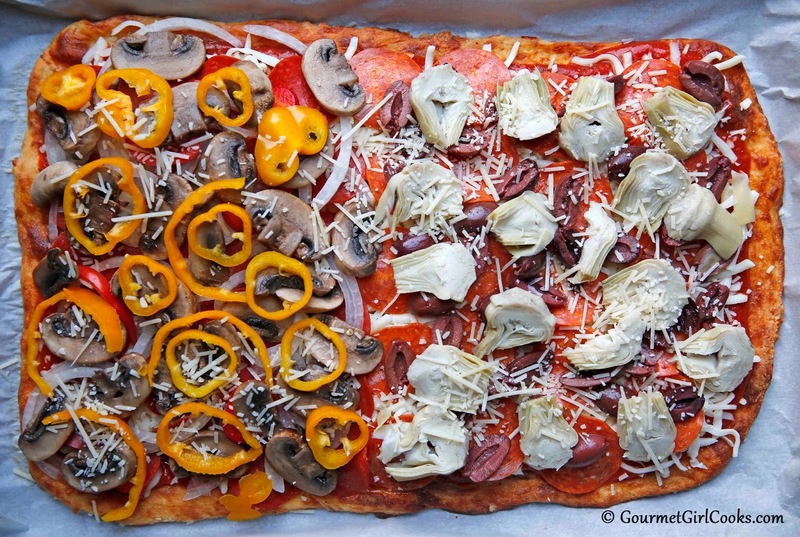 I snapped a quick photo of hubby's and my pizza before I popped it back into the oven to bake again with the toppings. Here's the link to the recipe: Cheese Head Pizza Crust. Enjoy!